Larry J. Sabato's Crystal Ball » House 2016: Is It Possible for Republicans to Kick Away Their Majority? House 2016: Is It Possible for Republicans to Kick Away Their Majority? Republicans working to maintain the party’s historically large House majority appear relatively confident about the aspects of the next campaign they can control: incumbent performance, recruitment of challengers, staffing, fundraising, etc. What concerns them are the aspects of the campaign they do not control. Which brings us to today’s action on Capitol Hill, where the House GOP caucus is taking its first step toward replacing retiring Speaker John Boehner (R, OH-8), who is set to resign at the end of the month. If Republicans ultimately choose poorly in replacing Boehner, or if the more rambunctious members of the House majority do not allow that person to govern, there is a chance, however remote, that the GOP could kick away its otherwise ironclad House majority. But such a monumental disaster for Republicans would require more than just the House becoming even more unruly than it’s already been over the last several years. Democrats do have a list of about 15-20 credible targets, while Republicans have a shorter list of plausible pickups (these are the Toss-up and Leans seats listed in our Crystal Ball ratings, shown below in Table 1). If Democrats hold the latter and win the lion’s share of the former, they could be about halfway to netting the 30 seats they need to win the House. But then the list of true targets dries up. In order for the Democrats to really threaten the Republican majority, they are going to need a major GOP meltdown. 1. The new speaker, be it House Majority Leader Kevin McCarthy (R, CA-23) or someone else, does an even poorer job of controlling the caucuses’ far-right id than Boehner, and a December shutdown is just a precursor to a year of widely-covered chaos in the House leading into next November. The key term here is “widely-covered” — the House Republican caucus would have to be so dysfunctional that it became a perpetual national story, generating bad headlines for the party and its presidential nominee. 2. Many swing-seat Republicans, including some who have been serving in the House for years and who typically have easy elections, recoil at the bleak post-Boehner landscape and decide against running for another term. 3. The party’s presidential nominee, who may have spent late 2015 and the first half of 2016 cheering the efforts of shutdown-hungry elements of the Republican caucus, ends up being a colossal general election dud. It would take something this dramatic to put those Likely Republican seats, and the House, in play: a collective Republican self-immolation. Item No. 1, or at least a short shutdown in December, is probably the most likely. But even if there is a December shutdown that does temporary damage to Republican numbers in the House generic ballot polling — which is exactly what happened during the October 2013 shutdown — it might not have long-lasting effects. Clearly the 2013 shutdown didn’t prevent Republicans from having a strong 2014 midterm. But that’s not to say a short shutdown would do no damage. National Democrats, who are watching the Republican leadership fight with glee, are looking for “Lee Terry Moments.” Terry, a former Republican congressman from Nebraska, memorably said he could not “handle” giving up his paycheck during the 2013 shutdown. While memories of the shuttered government faded, Terry’s comment did not, and it contributed to his loss to Rep. Brad Ashford (D, NE-2), one of the few bright spots for congressional Democrats on election night last year. Democrats hope an unflattering shutdown spotlight might lead to similar mistakes that they can later turn into campaign ads. Democrats are facing questions, not unfair ones, about their recruiting this cycle (see the Roll Call piece linked above for what is for Democrats a sobering but accurate assessment). They lack credible candidates in several seats vital to any future Democratic House majority. But there are still months to go, and Republican strife could serve as a great recruiting tool. So, too, could the retirement of entrenched incumbents. A number of Republicans from swing seats did retire last cycle, like Reps. Jim Gerlach (R, PA-6), Tom Latham (R, IA-3), Gary Miller (R, CA-31), Jon Runyan (R, NJ-3), Frank Wolf (R, VA-10), and others. But Republicans held all of their open seats except for Miller’s, an outlier that for complicated reasons he had little hope to hold anyway. These retirements ended up being well-timed for a midterm dominated by Republicans. The GOP could have a harder time defending the seats of some members who have already announced their retirements this cycle, like Reps. Dan Benishek (R, MI-1), Mike Fitzpatrick (R, PA-8), Chris Gibson (R, NY-19), and John Kline (R, MN-2). History guarantees that more retirements are coming. The key question for Republicans: How many more, and from which districts? Historically, it’s easier to capture an open seat than to beat an incumbent. The upcoming election could follow many different paths, almost all of them leading to continued Republican control of the House. But, as outlined above, there is a path for the Democrats, one that the House GOP leadership battle will help widen or narrow in the weeks and months to come. Democrats probably cannot win the House next year, but Republicans can lose it with a combination of boneheaded missteps at the House and presidential level. That Republican doomsday scenario should be on the minds of GOP members as they take their first step today toward picking a new leadership team. A number of noteworthy ratings changes and developments in individual races are discussed below. These rating changes are mostly favorable to Democrats, though that should not be taken as a sign of a recent overall trend toward Democrats in the House. Remember: Republicans are at a high-water mark in the House, holding their biggest majority since right before the Great Depression. It’s not impossible that the Republicans net a few House seats next year, but the far likelier outcome is that the Democrats net at least a few new seats of their own. If that’s what transpires, there probably will be a handful of House incumbents on the chopping block. At the moment, two House Republican incumbents clearly seem more endangered than the rest: freshmen Reps. Rod Blum (R, IA-1) and Cresent Hardy (R, NV-4). Both hold districts that are several points more Democratic than the nation as a whole, and they were two of the biggest surprise winners on election night 2014. Our sources on both sides of the aisle agree that Blum and Hardy largely stand out as the most threatened Republicans, and we thought we needed to distinguish them from the other vulnerable Republicans. So both Blum and Hardy move from Toss-up to Leans Democratic. There are competitive primaries in both seats to determine which Democrats get to face these endangered incumbents. If either or both of these incumbents hang on, Democrats will probably have a rotten election. A trio of other GOP incumbents move from Leans Republican to Toss-up. Rep. Mike Coffman (R, CO-6) won a relatively comfortable victory over a solid opponent in 2014, but he almost lost to a weaker one in 2012 with presidential-level turnout. While Rep. Bruce Poliquin (R, ME-2) has impressed many Republicans after his surprising 2014 victory, he too will face a different kind of electorate in his vast district, which covers most of Maine. And Rep. Lee Zeldin (R, NY-1), who some sources believe has not tailored his persona and voting record to his perpetually swingy Long Island seat, is likely to face one of two well-funded Democrats. Based on incumbency, all three of these members probably retain a tiny edge, but Democrats will go after them hard and they should face strong opponents. Republicans have a handful of real targets. 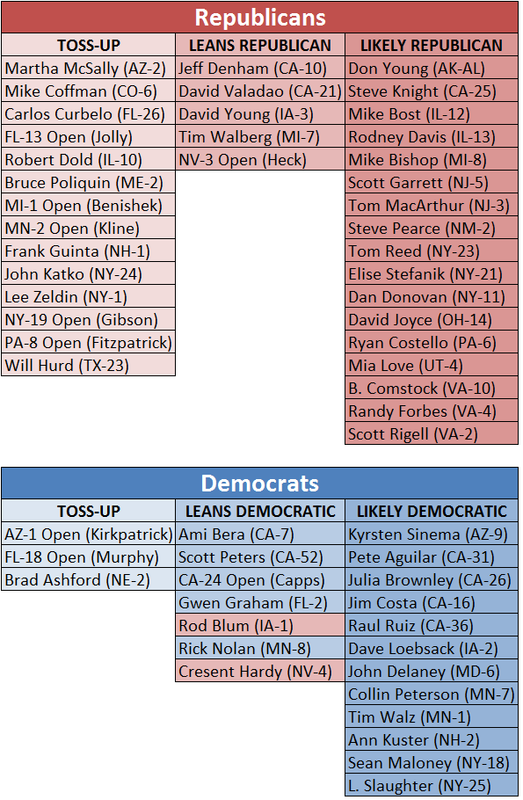 The decisions by Reps. Ann Kirkpatrick (D, AZ-1) and Patrick Murphy (D, FL-18) to run for Senate opened up two of the five Democratic-held House seats won by Mitt Romney in 2012, and they are both in the Toss-up column. But outside of these districts and a handful of others, Republicans are mostly faced with targeting incumbents they failed to beat in a favorable environment last year. One of them, Rep. Sean Patrick Maloney (D, NY-18), dispatched incumbent Nan Hayworth (R) in 2012 and then narrowly beat her in a rematch last year. He moves from Leans Democratic to Likely Democratic as Republicans consider whether he’s worth going after this cycle. There is some good news for Republicans in these rating changes. Rep. Jackie Walorski (R, IN-2), a narrow loser in 2010 and then a narrow winner in 2012*, goes from Likely Republican to Safe Republican. Democrats do not seem interested in seriously vying for her seat, which is more Republican than any district they currently hold. And while Democrats have lined up to run against Hardy, the accidental Nevada congressman listed above, the party is still searching for a candidate in NV-3, an open seat that Rep. Joe Heck (R) is giving up as he pursues a Senate seat. State Senate Majority Leader Michael Roberson (R), who might have been the party’s U.S. Senate nominee had Heck decided to stay put, is running for this seat, and despite some potential troubles on his right is clearly the top candidate on either side. We’re moving this race from Toss-up to Leans Republican as we wait and see whom the Democrats come up with. One important note about these ratings: We realize that both Florida and Virginia are likely to have new House maps sometime soon, and those new maps will change ratings. In all likelihood, Democrats could get a decent chance to net a seat or two in both the Old Dominion and Sunshine State. We analyzed some possibilities in the Crystal Ball recently, and that analysis has not changed. Our current ratings reflect the existing maps, and we’ll tweak them only after the new maps are finalized. Florida and Virginia’s remapping is but one of the many factors affecting the 2016 House battleground, though in terms of overall importance, it pales in comparison to the path the Republican majority decides to take in its leadership battle and beyond. *Correction: This post previously misstated Walorski’s electoral record. She lost as a challenger in 2010 and then won for the first time in 2012.